There's a thread on The Miniatures Page about favorite Dungeons & Dragons novels. Although not official D&D books, the Guardians of The Flame series was suggested by one commenter. I got the first book in the series, The Sleeping Dragon, from my local used bookstore (for only $1.50). It was published in 1983, which is apparent when you read the first chapter. The main characters seem like they could have been taken from a John Hughes film: there's the jock, the nerd, the easy girl, the reserved girl, etc. The modern-day role-playing gamers are magically transported to the very fantasy world they've been playing. Each of them appears in the body of the character they created back at their college campus. So the wheelchair-bound nerd wakes up in a sturdy dwarf body, the drama major is a muscly warrior, and so on. The premise is a common one. I can think of a 1980s Saturday morning cartoon, a 1980s/90s computer game series, and a bunch of other novels that magically place a modern character in the past or in a fantasy world. Still, I'm sure it's an appealing idea. I for one remember reading LOTR when I was in junior high and wishing I could wake up in Middle Earth. The characters proceed to travel the magic land in search of a portal back home. The story is made up of a series of short encounters/adventures, that are similar to the playing sessions of a RPG. Rosenberg vividly describes his world and writes well, but I found the central premise to be distracting. The constant reminders that these college kids are really from earth prevented me from immersing myself into the fantasy world. There are seven characters who go by their ordinary earth names and/or their role-playing character names. I didn't get a hang of all these names until about half way through the book. Yet, there was something engaging about the duality of these characters. The personalty of a rpg character was often at odds with the mind of the kid from earth. It was interesting to see how each of them dealt with this internal conflict. The plot ran well, although it got unexpectedly disturbing near the end. I don't want to spoil the book with details, but I have to say the events seemed inappropriately dark for a book with such a frivolous premise (this is not a book to give to your kid). This was Rosenberg's first novel, so it might be interesting to see how his writing and story developed in the next book of the series. If I happen to find a $1.50 copy of The Sword and the Chain the next time I'm browsing, then I'll probably pick it up for a read. A friend who read the books back in the day said much the same as you. 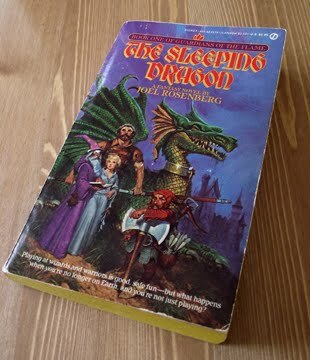 I have always been tempted to read them myself, but have stuck to my guns and avoided anything by Rosenberg because of his comments from the Feist-Barker flamewars over the origins of the "Riftwar Saga".